When choosing a marquee wedding there are a few things to consider. Choosing the venue and location for your wedding can be difficult. There are many factors to consider like your budget, guest numbers and what decoration or theme you would like? A marquee can give you freedom and flexibility to have the perfect day that suits you. 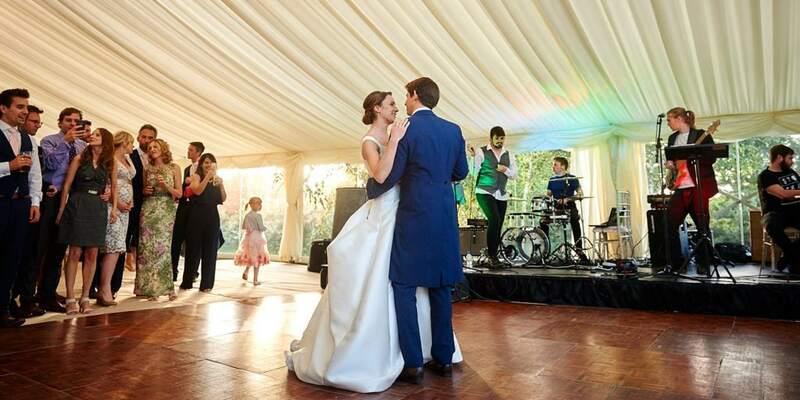 Here at Barny Lee Marquees we list why we think why a marquee wedding is a great option to create your perfect day. You can choose exactly where your wedding reception will be. You can choose a Garden, field, tennis court, a beach or cliff top. The marquee can be put up at home, at a parents, friends or relatives or at any chosen wedding venue. You can make the most of spectacular coastal or country views and scenery, or of a place that is special to you. Many couples decide on a special location where they have visited together as a couple, and a place that holds lasting fond memories for them. The venue and location may be chosen because it geographically works well for guests. Many established wedding venues that host venues also have bridal and guest accommodation as well. This allows you to spend the whole weekend with your friends and family in the perfect location that suites everyone. A marquee is a blank canvas that allows you the freedom to design and decorate as you desire. You can create a really special atmosphere and turn your dream plans into reality. You can theme your marquee glamorously, minimal, modern, classic, country, rustic, vintage, formal, informal, fairy-tale, with a festival style or mix it up – the possibilities for dressing up marquees hold no bounds. Clear-span marquees can incorporate garden features such as ponds, flower beds, bushes and trees. They can be linked off buildings, adjusted to split levels and built to a specification to make the wedding marquee fit in with your requirements and desires. A clear span marquee has sides and the ceiling in a clear transparent material allowing you to see right through to the outside, these have increased vastly in popularity over the last few years. When you choose a marquee you can build your wedding from the ground up creating a personalised design for you and your guests to experience. You can choose colours and styles of flooring, chairs, linen, cutlery, glassware, table decorations and wedding favours. Decide whether you would like large circular round tables or rustic banqueting tables. How would you like to set out your interior? Table positioning, dance floor and stage. Dance floors come in various colours some with LED twinkling lights they can be positioned in the middle of the marquee or on one end and are sometimes put in a separate linked tent to create a dance zone. The stages and dance floors can be sized according to requirements and the number of guests. Lighting whether it is spotlights, chandeliers, uplighters, hanging lanterns, festoon strings or twinkling star lights can be incorporated to add atmosphere. 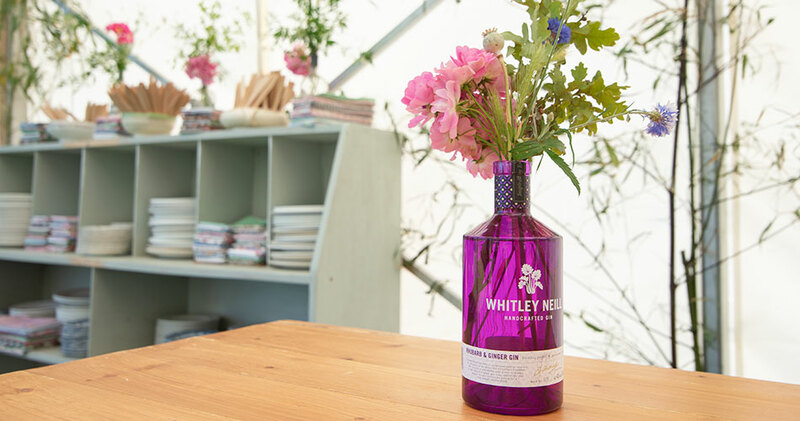 Floral garlands and displays, greenery, potted trees, plants, ribbons, bunting, overlays and props and decorations can be added to make your marquee unique. A marquee reception allows you to choose a size of marquee that will accommodate all of your guests. They are modular so can be adjusted to fit requirements or to fit into a desired space. 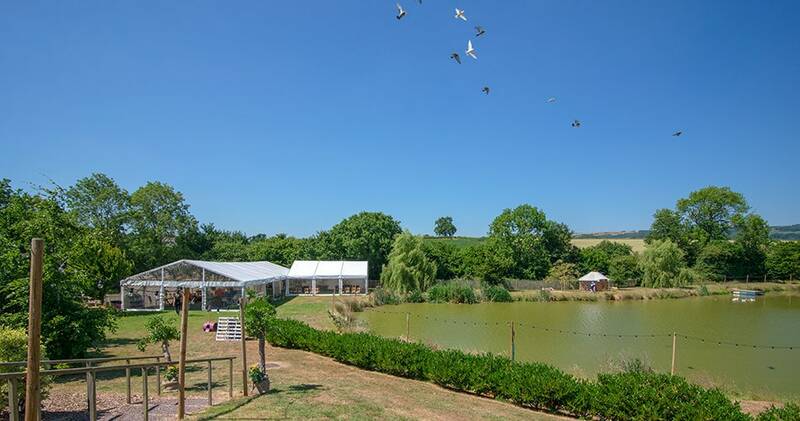 Entrances, doorways, porches, windows, catering tents, bar tents, kids play rooms and bespoke relaxing chill-out marquees or areas can be added it required to fit in with the chosen layout. Your marquee can be divided into sections or rooms if required. Dance floors, stages and special areas can be revealed at different times throughout the day. Self-contained luxury trailer toilets can be set up as well as generator and power distribution equipment to run the wedding reception evening party. A marquee can be more affordable than a traditional bricks and mortar fixed venue. 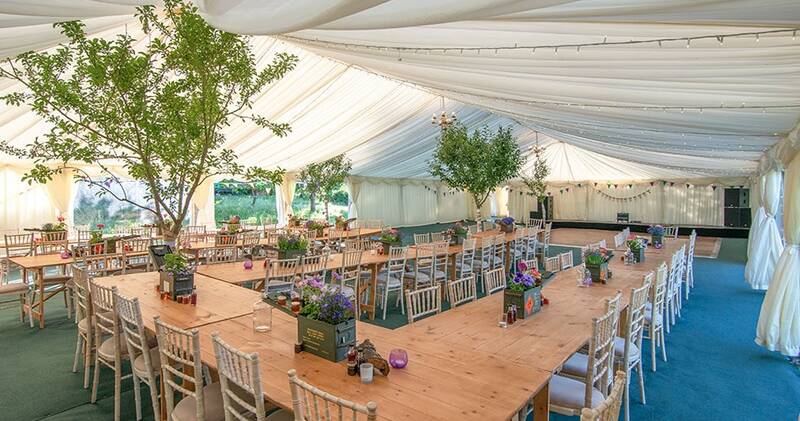 The size, layout and decorations in a marquee can be easily tailored to fit into your budget. You can have your marquee professionally decorated or you can be as creative as you like with your own decorations, flowers and DIY; yourself. A marquee wedding can give you ultimate control and flexibility as it allows you to select your own caterers, florist and decorations to fit your style, taste and budget. With a marquee you are not restricted to in-house venue caterers. There are huge amounts of catering options that can be utilised in a marquee. There has been a recent trend into quirky vintage vans and converted horse boxes and trailers who can offer a wide range of catering and bar options. We can provide a catering tent, bars and catering stations if required. You can choose from roasts meals carved at the table, buffets, fine dining menus, hog roast, paella, fresh pizza, crepes, fish and chips, ice cream or internationally inspired street food. These arrangements can be tailored to fit personal taste and budget. Please ask us for any recommendations of companies we have worked with before. Having an outdoor wedding and receptions in summer is a lovely idea, but due to the unpredictable British weather a marquee is always a very good option. By using panoramic or transparent roofing, walls and gables guests can be sheltered from the elements while still enjoying the outside scenery and natural light. Walls can be opened right up all around if the weather is kind but also can be drawn closed if the weather turns for the worse. Barny Lee wedding marquees can be positioned to make the most of the views, sunlight or shade in the day and light displays at night. In cold spells large indirect heaters can be installed and if the site is wet, uneven or prone to flooding solid wooden floors and solid opening doors can be used. Some venues have restrictions in terms of preferred suppliers and the rooms have standardised decorations and equipment which may not align with your vision. With a marquee you can tailor the surroundings to your own unique style. You are totally unrestricted with timings and you can continue into the the late hours. You can even use the marquee again the next day for breakfast or lunch. Some venues charge corkage on drinks and insist on their price per head caterers. In a marquee you can do as you desire and tailor things to suit yourselves. Our expert team can erect your marquee early in the morning the day before and deliver all desired equipment to give plenty of time for you and your caterers, florists and vendors to get things ready throughout your special day. With so many marquee options give us a call to chat about your special day on 01934 713198. Visit our website barnyleemarquees.co.uk and our Facebook page facebook.com/BarnyLeeMarquees for photos of previous wedding marquees over the years. Contact us to arrange an no obligation on-site visit where we measure up and discuss the proposed site and discuss all the different marquee and furniture options. We assist you with the planning and design process producing scale CAD (Computer Aided Designs) drawings and advise you on how to make most of your location in the day and throughout the night.